I think that the general consensus of 4 to 16 Characters from people I’ve spoken to or reviews I’ve read that it was ok. Kind of in the ok to sort of didn’t like kind of range. But for me it was just in the ok range. In fact I liked some parts. One of the things I liked was the main character, Jane. It’s so great that an author has finally written a book about a character who isn’t overwhelmingly strong and that aspect makes it more realistic. Although it got a little annoying at times. 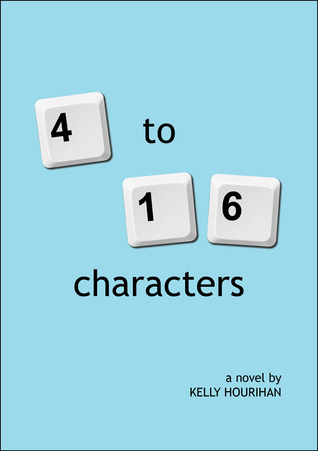 What attracted me to the book was what the synopsis suggested, that the story would be about a girl with multiple different online personalities. And it was, but just a little. I would really have liked the book to be more focused on that. I really liked the ending. It was cute and I’m pretty sure it brought up my rating. One other thing that annoyed me was Gary. He makes fun of Jane for being online all the time but he always seemed to answer whenever Jane asked him something. Meaning he would have been online. In other words, he was a total hypocrite. But other than that, I didn’t actually mind him. That’s pretty much all I can remember because I wrote the first edition of this review a week or two ago and it was never posted because something went wrong and therefore I lost it. So that was my review of 4 to 16 Characters 2.0. Minor indent. Could have been a bigger hit.